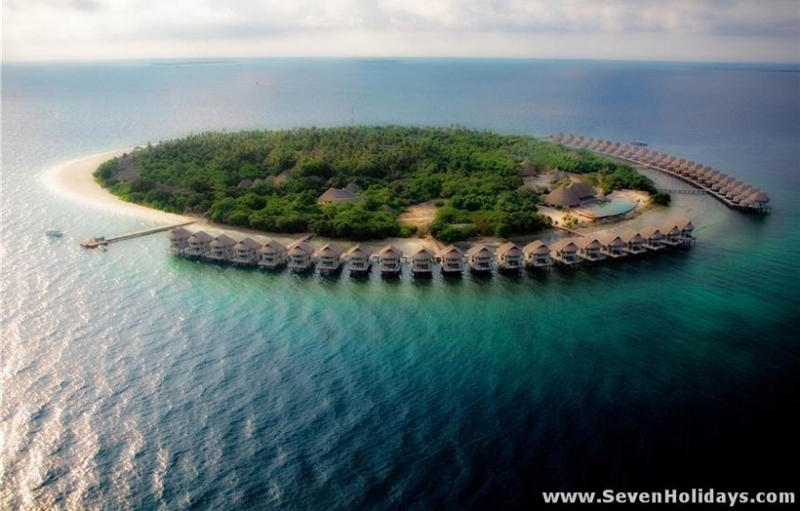 Formerly known at Cinnamon Island, it was taken over in August 2010 and re-branded as J Resorts Alidhoo. As yet, the resort still appears to be ‘work in progress’ but there’s definitely potential there. The lagoon is very small, so the beach is narrow and its location shifts throughout the year. The new owner of the resort intends to leave the movements of the beach up to nature, rather thanpumping in gritty sand from the lagoon or creating sea walls. However, there are daily free trips to a fine sandbank nearby. Walking almost immediately onto the reef means there are coral pieces underfoot but the ease of access for snorkelers is obviously good. The water is clear and there are some interesting scattered patches of coral, attracting some large parrotfish and other colourful reef fish. Unusually, there are no steps into the sea from the terraces of the Ocean Villas, apparently because the sea can get quite rough. More impressive reefs are accessible via the regular snorkeling dhonis, organised by the watersports centre. The lush, jungley interior is indeed a highlight of the resort, with plenty of well-established vegetation including some beautiful banyan trees, bushy pandanas and lofty coconut trees. The new management has made an effort to tidy up the large swathes of jungle, which became somewhat dishevelled during the Cinnamon Island days. All the greenery makes the setting of the semi open air Village Restaurant pleasant, even if the buffet isn’t too inspiring. The public areas and villa exteriors are also still in need of a bit of a clean-up, which they tell me is an ongoing project. 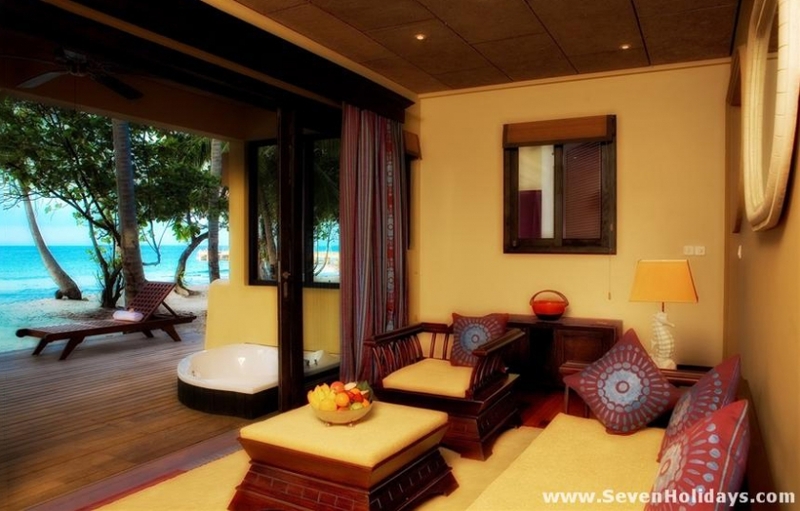 J Resorts has rebranded Alidhoo as a 4 star resort, after it was initially created as a 5 star property. Due to Cinnamon group’s legacy, the decor which J Resorts inherited (and has left largely unchanged) includes some nice 5 star flourishes. 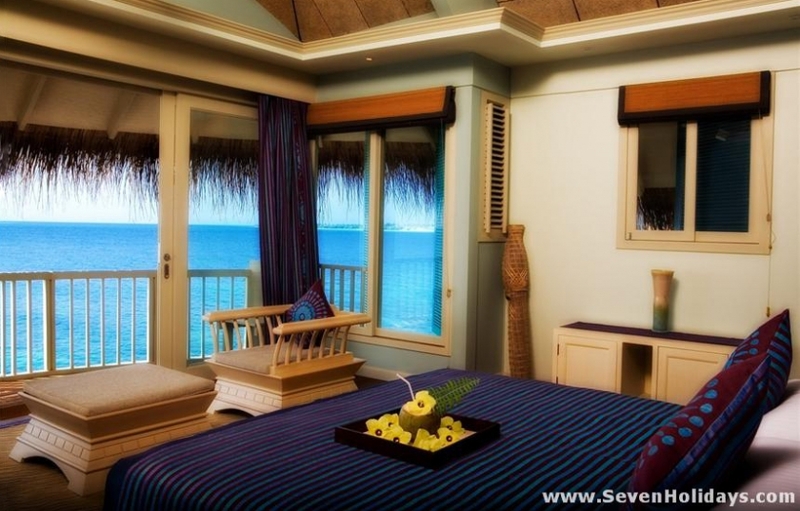 The interiors of the rooms are definitely more than what you’d expect of a typical 4 star resort. But the public areas and villa exteriors (including the sundecks) are definitely in need of a lick of paint and some repairs (no doubt in part due to the salt in the air as well as general wear and tear). It has the potential to look great, once the cosmetic work is finished. 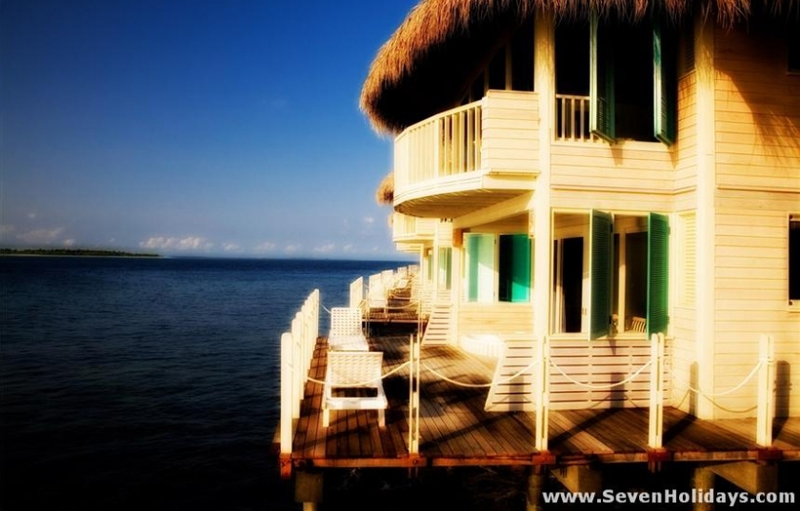 The 2-storey Ocean Villas are clad in painted wood with thatched roofs and an attractive white and turquoise colour theme inside and out. They have a sundeck with a jacuzzi on the ground floor and a small balcony on the top floor. Downstairs is a wide hall and living area, plus a semi open air bathroom. Upstairs contains a small landing, a second bathroom and a bright bedroom furnished in a modern style, with nice touches such as ceramic vases, original paintings and colourful wall hangings. A flatscreen tv plus a cd/dvd player are included, while there’s tea and coffee facilities in the ground floor living area. 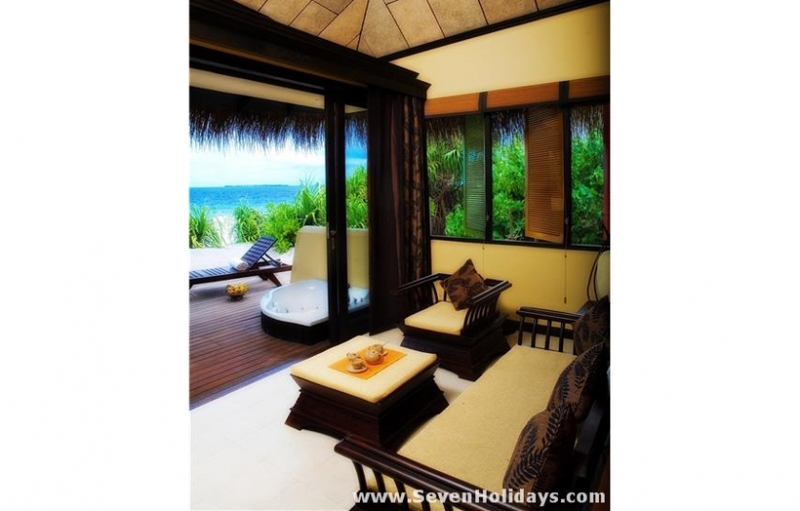 By contrast the thatched Beach Villas have a more masculine feel, with plenty of dark polished wood and a brown and crimson colour scheme which looks quite classy. The living area opens out to a terrace in front of the beach but it’s largely shaded by a canopy of trees, so sunseekers are better off finding a patch of beach or opting for an ocean villa. There’s a jacuzzi on the terrace and a waist-high wall allowing a little privacy from the neighbours for anyone using it, but otherwise the outside areas of the beach villas aren’t separated from each other. 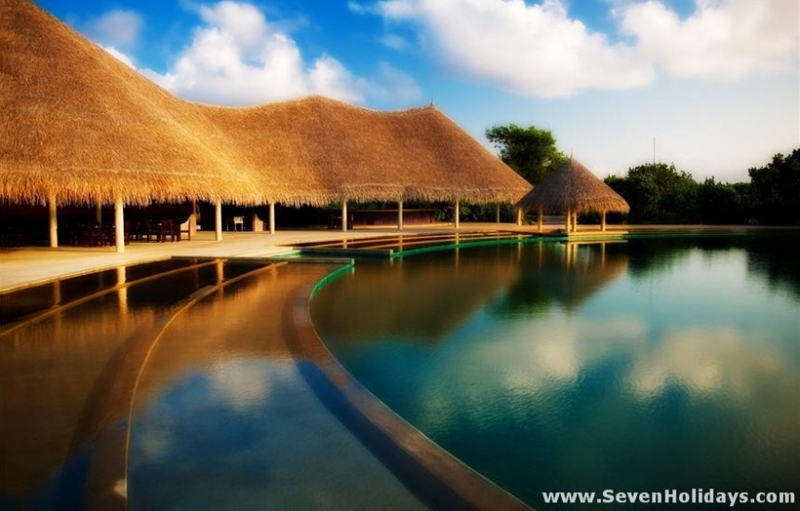 Bliss Bar and Waves à la carte restaurant are the hub of the resort, located next to the large freeform infinity pool. There’s also a swim-up bar and shallow section of water which sunloungers and umbrellas have been placed in. Regular live music, discos and bodu beruperformances take place here. 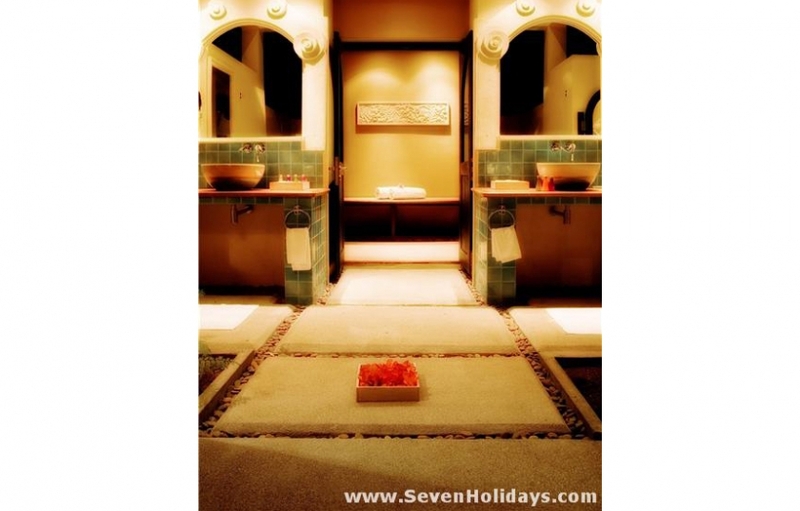 The Chavana Spa is run by the very experienced Mandara company. 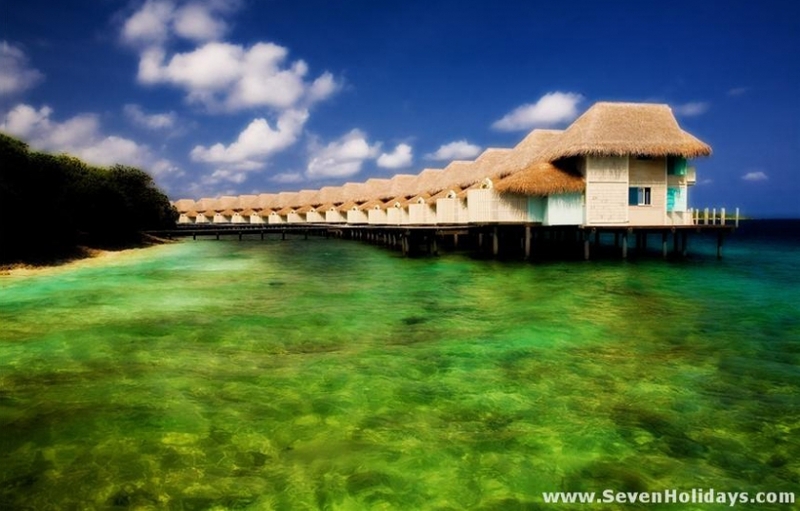 There are 5 coconut-thatched treatment rooms. The sound of birdsong from the surrounding trees creates a very relaxing environment for the various Balinese therapies and beauty treatments. This is an isolated island in the far north of the country. The hour long internal flight and 20 minute speedboat ride can be seen as a tiring addition to your long-haul, or a great bonus way to see the country. The management have put some extra effort into different excursions to take advantage of the unspoilt local islands, both inhabited and uninhabited, including the historical island of Utheema.